Today is Darwin Day. What is it? The International Darwin Day Foundation website provides resources and publicity for individuals and institutions across the world to celebrate science and humanity every year, on, or near, February 12, Darwin's birthday. In addition to information about the life and legacy of Charles Darwin, this website provides practical examples, advice and templates for organizing and publicizing Darwin Day events. It also provides a directory of events where you can find celebrations taking place near you or register your own event for others to find. 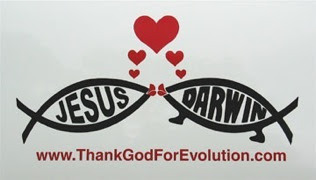 Be sure to check out Thank God For Evolution and The Great Story for resources on how to celebrate this holy day. If your are near our mountain, this weekend would be a good one to take family and friends to the Gray Fossil Site. Or attend an Evolution Sunday service at FPC Elizabethton. We have a great one planned! Be sure to discover your inner fish during our adult forum! We are ecumenical. HVUUC in Gray is celebrating Evolution Sunday too! Here are some more ideas from Michael Zimmerman, founder of the Clergy Letter Project.